Packing cubes are a great overall thing to purchase if you want to have easy, efficient, and effective means of carrying around your travel gear with a limited amount of space. Nobody who travels a lot enjoys carrying around a ton of stuff. This is one of the realities of travel which can be hard to accept for a while. One of the things that has really helped me cut back and conserve space are packing cubes. Packing cubes are used basically exactly how they sound. You pack as much clothing or accessories into a cube and zip it closed. They excel at compressing your clothing together to create more space that otherwise wouldn’t have been created. If you are looking for the best packing cubes, here is a list of the best packing cubes 2019 has to offer. Due to their overall quality, durability, and options for customization, the PRO Packing Cubes Travel Packing Cubes are the best packing cubes available right now. These packing cubes are so efficient that you can guarantee that they will add 30% more space to your backpack or suitcase. This is great for people who only carry one or two bags and want to make sure that their luggage fits the requirements necessary for going on an airplane. What really makes these the best packing cubes are their durability. Being able to compress down your clothing to add 30% understandably requires the material to be strong enough to hold some extra weight against the zippers. Thankfully, you won’t have to worry that the zippers will snap off since they are so well-built. Durability and compression should be the top concerns for packing concerns, and neither of those will be a problem here. Not everybody wants to spend a ton of money on packing cubes. This is completely understandable. For anybody with wanderlust, the best things to spend your money on are plane tickets and experiences. I get it. However, the Yepal 3 Piece Packing Cubes will fit into anybody’s budget. They may not be the best packing cubes available as far as material quality and durability go, but if you are sure to take care of them you should make them last for a while. Coming with plenty of different retro colors to choose from, a waterproof shoe bag, and a quality laundry bag, the GreEco Packing Cubes are the best packing cubes any guy who wants to balance off style with durability. Since they come with a shoe bag and a laundry bag, you will be able to carry around a nice pair of Jordans (or whatever your favorite brand is). The included laundry bag will also help you keep your dirty clothes separated from your clean ones, allowing to easily know when it is time to do laundry again. Although they aren’t quite as good at compressing down clothes as the best packing cube, these packing cubes are great for anybody who just needs a little bit of help organizing their possessions. Ladies might have special needs when it comes to packing cubes. This is mostly true if you are a woman who likes to carry around cosmetic and beauty equipment. These sorts of things normally take up quite a bit of space. However, with packing cubes you can cut back on some of the space you spend on things like eyeliner and mascara so that you can leave plenty of room for other things. The amount of space and unique storage makes these the best packing cubes for women. Although many women like the color pink, the ZackX Packing Cubes are also available in blue. Since these packing cubes come with 9 different cubes, ladies can easily classify and organize where they put each of their articles of clothing. It also comes with a shoe bag and dirty laundry bag so that you organize the things that you want to keep away from clean clothes and electronics. A family needs a lot of space to store all of their clothing, electronics, toiletries, and other accessories needed for travel. As a result, you will need plenty of packing cubes to be able to store all of your things. The best packing cubes for families are the PRO Packing Cubes with 10 Pieces simply because they are great for families who have multiple people to pack for. 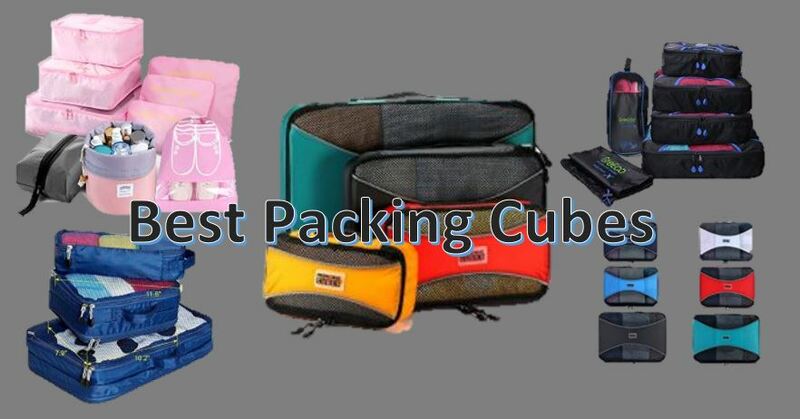 As stated above, the fact that these cubes compress to allow 30% more space and have very durable construction and zippers is really what makes them the best packing cubes for families. Available in many different colors, anybody in your family, boy or girl, will be able to have a set of cubes that they like. Best of all, you will be able to save space and make sure that all of your things fit in your luggage. If you simply want the best packing cubes, you really should check out the PRO Packing cubes since they are the most durable, space-adding option available. You won’t have to worry much about breaking zippers are ripping the bags with these options. Since these packing cubes come in packages with many different cubes, they are also great for families with lots of things to pack. Anybody who simply wants to save money and get one of the most affordable packing cubes available should be happy with the Yepal 3 Piece Packing Cubes since they are very reasonably priced. If you a man who wants to add some style to your packing cubes, check out the GreEco Packing Cubes for the retro design and shoe bag for carrying around your extra pair of shoes. Ladies who want to add a little bit of class to their packing will enjoy the ZackX Packing Cubes since they come with great colors, a cosmetic bag, shoe bag, laundry bag, and 9 total pieces for carefully organizing your things. In any case, purchasing the best packing cubes should be a reasonably straightforward process despite your budget and personal needs.